Start the new year off right at an Open House at Hoff-Barthelson Music School! An Open House for the School’s Early Childhood Program takes places on Saturday, January 20, 2018, from 12 noon to 2:00 pm. Children ages 3 months to 5 years and their adults are invited to join in the fun of a music and movement class at 12:30 pm, followed by a brief Q & A with faculty, and a reception during which you can socialize with other families. Exercises and games during the classes involve singing, moving and improvising; using small percussion instruments to promote inner hearing and rhythmic sensitivity; and working with a variety of whimsical materials to inspire the imagination. Through these activities, our talented faculty members guide young students to develop many of the skills involved in music-making and a joyful bond grows between children and their adults as they listen, sing and move together with the music. 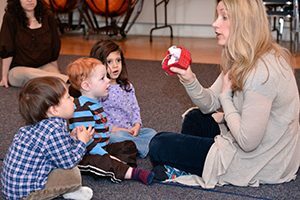 Hoff-Barthelson’s Early Childhood Program is grounded in Dalcroze Eurhythmics – a method of teaching that pairs music and movement to catalyze the development of children’s minds and bodies. Even the very youngest children develop focus, spatial awareness, gross motor skills, social skills, and the ability to work with others – all while having fun! Classes are available for parents/caregivers with their children as well as in a “drop-off” format for children who enjoy attending music class independently. Classes are taught by certified teachers and utilize live music. Snow date: January 27, 2018, 12 noon – 2 pm. Registration is ongoing throughout the year. Tuition is pro-rated based upon time of enrollment. Early Childhood Programs are made possible, in part, by ArtsWestchester with support from Westchester County Government, and the New York State Council on the Arts with the support of Governor Andrew Cuomo and the New York State Legislature. Photo credit and caption: Hoff-Barthelson faculty member Laura Barnet teaches an Early Childhood Music Class. Photographed by Steven Schnur.